First, a quick update on the TBH: after the deadout, it was restocked with a package and a Carniolan queen this Spring. 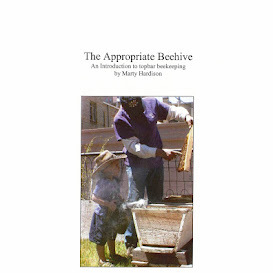 The hive is about 3/4 full, and forage in the Boulder area continues to be "superb." The hive will be moved back, however, closer to home to overwinter. Can't wait to see her again! Here's the skinny on the Warré hive. After four swarms, the parent colony (AKA Remainder) dwindled and dwindled until it was apparent that there was a problem. Traffic was decreasing, not increasing, and comb construction in their second box was slow at best. (Gotta love them windows.) We had hoped Remainder's new queen was as well-mated as the one in Swarm #4, but it turns out that she was short-bred and is now a drone layer. The one good thing to this is that the bees, having little brood to care for, have been able to focus on honey production. While their numbers are not great, they managed to fill several combs with honey. Rather convenient for her daughter hives. File Photo: Honeybee on marigold taken with a Canon 20D, EF-S 18-55 f3.5-5.6 lens and Cokin 3X filter. The prime swarm is doing great, due to the fact that it is headed by a queen that is in her second year. She shares genetics with the Ole School Survivor queen that we got from Grampa's Gourmet last year, and she lays honey-producers. It's the 2nd, 3rd and 4th swarms that are in predicaments. This is not unexpected, as an afterswarm typically issues while the daughter queen is still a virgin and it takes a good 2 weeks for her to mature, mate, and really get to laying eggs. And all the while worker bees are dying off. On the same hive stand as Remainder, Swarms 2&3 were put into another Warré hive. It would have been nice to provide them with drawn comb, but that is a luxury in a young apiary. The queen is not a bad-looking queen, and if she just had enough bees in her court to make the necessary preparations for Winter, it would be a very different picture. Instead, despite the fact that this colony is comprised of two swarms and was given a comb of brood from the prime swarm, this late in the year it is best to abandon hope that the colony will magically grow strong enough to make it through to Spring. Of course, with copious feeding and constant attention, it can be done. But two years in a row? I was proud to have done it once, but I don't want my career as a beekeeper to revolve around feeding weak hives. It's best to take our losses now, on our own terms, and combine weak colonies with stronger ones. Come Spring, such an overwintered colony can be split, bringing us back to the same hive count. Here, Remainder is the weaker of the two colonies, and Swarms 2&3 the stronger. One always donates from the weak to the strong, so Remainder was disassembled and her resources donated to 2&3. All the brood combs (no bees adhering) were put into the lower box to create a consolidated brood nest. The honey was put upstairs. A sheet of newspaper was laid across this honey box, and another hive body was set on top to receive the loose bees from Remainder. So that's why and how we combined two Warré honeybee colonies. BTW, the two wonky top bars still exist! They're beautiful honeycombs in the top box. We are hoping the colonies combine peacefully and grow strong enough to fill the top box to the point where it's harvestable. With any luck, we'll be able to pull the box and finally get the wonky bars out of there this season. Golden Rains are pretty popular around here, and Chinese Scholars (both leguminous trees) will be blooming into August, so it's possible. Cross your fingers for us. JB wasn't able to find Remainder's queen, but there were eggs so she was there somewhere. We pretty sure, because the eggs were singletons properly centered in each cell. Multiple eggs or eggs on cell walls would indicate laying worker(s). If the drone-layer queen somehow manages to be the victor when the colonies merge, we'll be in trouble again. We'll let you know how it goes in our next post, where I'll be talking about shooting stars and requeening. TRIVIA: Did you know that a blind beekeeper named François Huber (1750-1831) wrote "New Observations on the Natural History Of Bees" based on what his servant saw? So glad you stopped by my blog and commented..I decided to check yours again and you may have answered a question I had. When the old Queen swarms..is there already a new Queen? You said it took about 2 weeks for her to get laying. This stuff is so interesting. Hi, Carol. It could take much longer than 2 weeks. It depends on what kind of queen the hive is left with. Typically the prime swarm departs when the first queen cell is capped. So she has to pupate, emerge, feed and mature a few days, go on mating flights, and make it back. In this normal situation, by the time she is laying, 4 weeks may have passed by. My situation was a little different. The prime swarm had departed weeks before, so we were working with already hatched queens. That is why I figured a couple of weeks, just enough time to feed/mature/mate/return plus some weather delay. I think it is really important to understand Bee Math. Michael Bush's website has a good section on it, and of course there are tons of sites on the Internet.